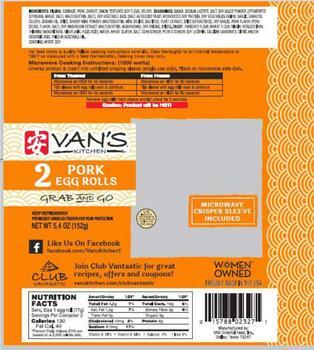 Van Oriental Foods of Dallas, Texas, is recalling approximately 10,385 pounds of heat treated but not fully cooked and not shelf stable pork egg rolls. The product may be contaminated with extraneous materials -- specifically soft plastic. The recalled product, bearing establishment number “EST. 13219” inside the USDA mark of inspection, was shipped to retail locations nationwide. Consumers with questions about the recall may contact Theresa Motter at (972) 685-0550.